Take Torygg's war horn to the Shrine of Talos. Speak to Elisif the Fair. Place Torygg's War Horn at the shrine of Talos (map). After you complete The Man Who Cried Wolf, Elisif's goodwill towards you has increased. So much so that she extends a tentative trust in you by making a personal request regarding her late husband, High King Torygg. She will tell you, "When we buried my husband I made offerings to all the gods... except Talos." This is because Talos worship is outlawed in the Empire. She would like you to take Torygg's War Horn and place it at a specific Shrine of Talos. 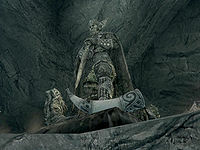 Although she doesn't worship Talos herself, her husband would have wanted a proper Nordic burial done in this fashion. Travel to the Shrine of Talos in the wilderness of Whiterun Hold, due north of The Ritual Stone. Follow the path near Shimmermist Cave, along the northern bank of the river, and you can find the shrine behind some trees. As you approach the shrine, Agent Lorcalin and a Thalmor soldier will appear and attack you, as Lorcalin is under orders from the Thalmor emissary to kill any Talos worshippers he can find. Once the horn is placed in front of the statue of Talos and the quest updates, you are free to take it away at any time without affecting the quest's progress, and it will no longer be marked as a quest item. Return to Elisif at the Blue Palace in Solitude where she will reaffirm her belief in you and allow you to purchase Proudspire Manor as well as take the next step to becoming a thane. Prior to completing the prerequisite quest, the horn can be pickpocketed from Elisif. It will be marked as a quest item and cannot be removed from your inventory without completing the quest. Fighting the Thalmor is not necessary to finish the quest; they can be calmed or evaded in order to activate the statue's base. The Thalmor may not spawn at all because of a random encounter such as a dragon attack, although this doesn't affect the quest. Objective 10: Take Torygg's War Horn to the Shrine of Talos for Elisif the Fair. On the PC, it is possible to use the console to advance through the quest by entering setstage SolitudeFreeform07 stage, where stage is the number of the stage you wish to complete. It is not possible to un-complete (i.e. go back) quest stages, but it is possible to clear all stages of the quest using resetquest SolitudeFreeform07.